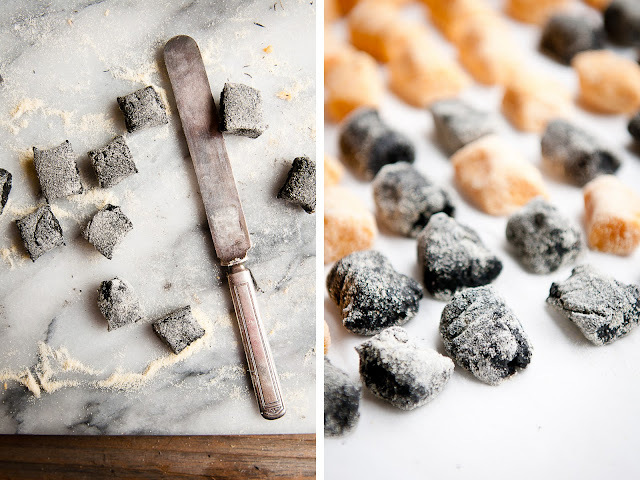 Desserts for Breakfast: Sweet Potato and Squid Ink Gnocchi, and Happy Halloweekend! 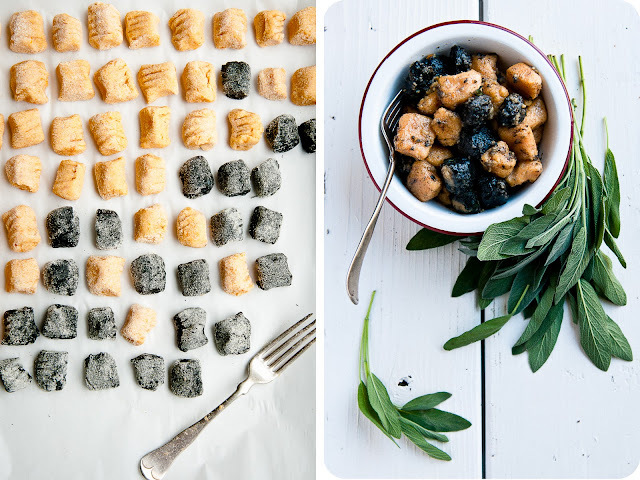 Sweet Potato and Squid Ink Gnocchi, and Happy Halloweekend! Just popping in quickly for a sneak peak of one of the items on my Halloween menu this year: sweet potato and squid ink gnocchi. Isn't the orange-and-black combination perfect for Halloween? Both my roommate and I have been so busy that we decided to forgo our traditional all-out Halloween party for a more intimate and casual sit-down dinner with close friends. The menu's all planned, and I'm so looking forward to some down time to be in the kitchen, relax, and enjoy a leisurely, delicious meal with wonderful people. 2. Prick the potatoes and sweet potatoes, for sweet potato gnocchi, several times with a fork. Place on a baking sheet and bake for 45 minutes - 1 hour, until fork tender. Remove from oven and let cool briefly. 3. Remove the skins from the potatoes and sweet potatoes. Puree in a food processor (or press through a food mill) until smooth and creamy. Place in a large mixing bowl. In the center of the potato/sweet potato mixture, make a well. 5. In a separate bowl, lightly beat the egg and mix in the nutmeg and squid ink, for squid ink gnocchi, until well-combined. Pour into the well in the potato puree. Add the cheese. 6. Knead to combine the egg, cheese, and potato puree. Gradually begin to add the flour until the mixture is smooth but still slightly sticky. 7. On a well-floured surface, work with a handful of dough at a time, rolling it out into a long rope and then cutting small, 1/2-inch pieces. Roll lightly in flour and mark with a fork if desired. 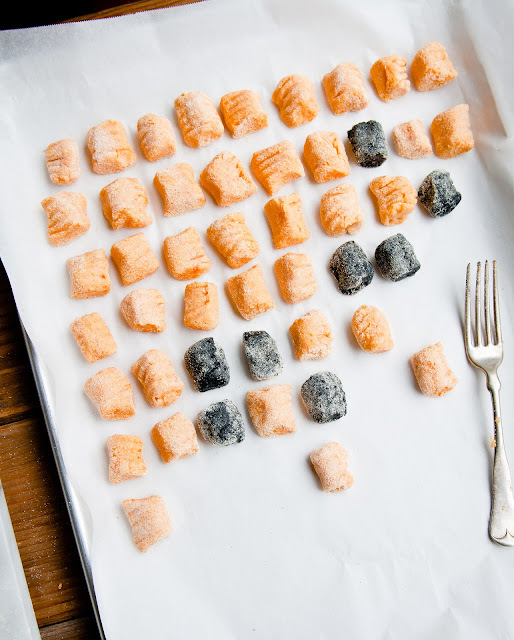 Place each gnocchi separately on a parchment-lined baking sheet or a well-floured baking sheet. 8. If you are to freeze your gnocchi for later use, place the entire baking sheet in the freezer until the gnocchi are frozen. Then transfer to a storage container and return to the freezer. 9. To serve: cook gnocchi in a pot of well-salted boiling water. Then fry in brown butter and sage, or serve with desired pasta sauce. [EDIT] Note: You can likely find squid ink at well-stocked fish counters, although my local Whole Foods does not carry it. In the Bay Area, I found my squid ink at Berkeley Bowl but was also pointed to Asian grocery stores with good seafood counters (e.g., Ranch 99). The squid ink I got was in frozen form and imported from Italy. This might be a really silly question, but... where might I find "Squid Ink"? Maybe at an Italian goods store? Or do I have to ink the squid myself. (I know, you're probably laughing right now, but I have absolutely no clue.) HAH! ;-) Thanks, in advance, for the enlightenment! Hi Jackie! Not a silly question at all. It took me a bit of looking to find it, too. Try a fish market or Asian grocery store that has a well-stocked fish counter. I found the squid ink at a fantastically well-stocked local grocery (Berkeley Bowl), but when I asked the guys at the fish counter in Whole Foods, they pointed me to Asian grocery stores like Ranch 99. Perhaps an Italian goods store might carry it, too? FYI it was in frozen form when I found it, being imported from Italy. Apparently, you can ink the squid yourself too, but that sounds like far more trouble than it's worth, even in my book! me likey! they are awesome!! I have been trying to find squid ink too but always wondered if it needed to be the freshest! Hmm will chk out Italian stores.. good diea! Thanks, Steph! I've seen Italian recipes for squid ink pasta, and always wondered where to get the ink and had never looked around for it yet. We have a really big Italian store at Pike Place Market in Seattle. I'll check there first, but we also have Asian supermarkets, if they don't! Thanks so much! wow wow that looks out of this world! I want to make those right now! Brown butter..sweet potato...oh my god thanks for the recipe! Wow, I love these gnocchis, it's so a great idea for Halloween! Woah. Your past party food looks ridiculous! I'm sure you'll enjoy your intimate Hallo-meal, also. I don't know if you enjoy scary movies, but one of my friends recommended Devil's Backbone, same director as Pan's Labyrinth. I'm in exam week right now but can't wait to play catch-up with cooking, hopefully starting with gnocchi. Hello. I am first time on your blog and I am just taken aback by your photoes quality... now I have spent more than hour digging into your blog and I am sure I'll try some recipies.. Your blog inspired me so much! Never ever would I have thought to make Halloween gnocchi. Awesome idea and the shot with the sage leaves curling around is fantastic. beautiful! i love love the vibrant colors. okay, HOW cute are these?? Those are beautiful! Perfect for Halloween!